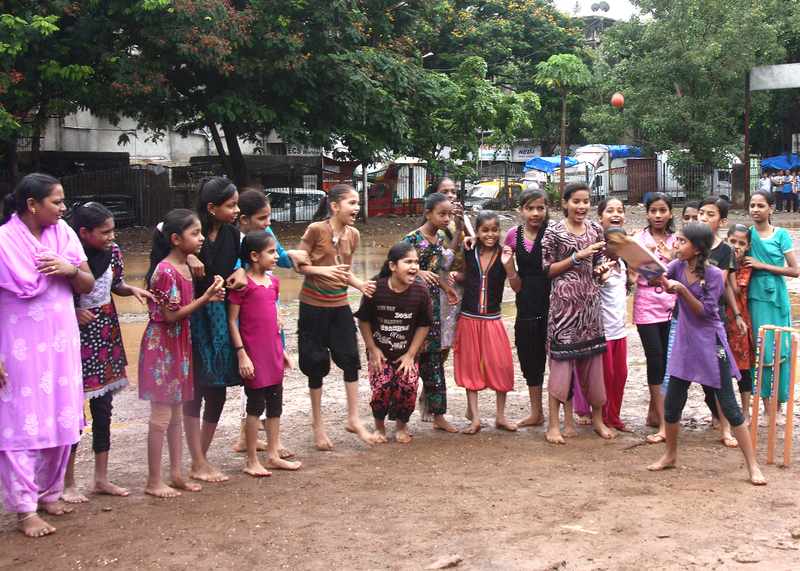 The newspapers amply captured how the unexpected heavy rainfall on a lazy Sunday ushered in the famous Mumbai Monsoon on 9th June, 2013; but what most people might not ever get to know is how on that very same day, around 200 young girls truly ruled the often neglected playground at Khotwadi, Santacruz. So, the next question that comes to mind is – How did they do so? And what’s so special about that? Vacha, a women’s rights NGO, active in Mumbai since 1987, organized this Sports event with the help of girl leaders selected from Vacha’s different Community Centres spread across Mumbai – as the girls beamingly asserted that these Kabaddi and Cricket tournaments have been specifically conceptualized and planned by girls, for girls! Before we forget, one cannot look away from the reality that there are still a few countries where girls are forbidden from participating in Sports – thankfully, India has never been one of those. But, when you hear a small girl in 4th standard chirp “I don’t play anymore. I used to play when I was small” one is not only forced to question the notion of how much younger does one need to be to play, but also probes us to confront the boundaries in our very own minds which take most girls further and further away from the neighbourhood playgrounds. The rains were relentlessly pouring with literally no ray of sunshine in the sky – however the drenched playground did not dampen the spirit of the Vacha girls who despite the heavy showers decided to go ahead with the event – come what may.. Thus, the day constituted of brief matches of kabaddi and cricket between teams from different bastis and a series of interesting game stalls for the non-participants. Soon, in no time “rain” became a secondary issue, as the air began to get filled with the lively competitive commentary – throwing audience like us into the suspense over which team would win?!! Mind you, the commentators ensured that the so called losing team rejoiced even more loudly; yet, it was still pretty intriguing to see how a little girl burst into pools of tears after losing a game – I’m not saying it’s a happy sight – but it was very new to watch a little girl from a Mumbai basti express her disappointment on not achieving her objective, while her co-team members or saheliyas tried to revive her spirits by saying how their team atleast got to learn what could they improve on in order to win next time. And in an hour or so a bunch of primary school girls questioned – “why only the didis were playing in the competition while they could only watch” – thereby triggering many other independent kabaddi matches – which brought out the range of players present – some were troubled over why their friends were not saying “kabaddi-kabaddi”, there were others who seemed to believe that the crux of kabaddi lies in pushing their friend in the puddle of water with a vengeance. On the cricket front, there were some who were just glad to hit the ball with the bat, while some other fielders were more than happy if the striker hit a 4 or 6 as that would give them a wonderfully plausible excuse to wade through oodles of flooding water just to get the prized ball. Spectators were there too – residents from the surrounding buildings were braving the harsh rain to peer through their windows; men from the neighbouring basti had come to see what the “hulla-ballo” was about, little boys who usually preside over this playground were instead watching the match from the side-lines – the tables had indeed turned! Though, could one also take an ambitious and difficult step into the future and envision a tournament involving mixed teams of girls and boys? Of course, this is truly just the beginning – at the end of the day all the girls have to go back to their homes – to the world of “shoulds” and “should nots” – some girls’ mirth may continue to linger even after they reach their homes, some may be slowly dwindling into the apprehension of the impending argument with their families over why they are soaked, and some may have already started crying over how angry their brothers would be when they see that they ripped the raincoat in all the running and jumping. Therefore, these girls (each a leader in her own right) have a long way to go – but this Sunday, this rain, this playground, this sudden freedom – cannot be taken away from them – this ‘time’, their ‘time’ is for them to keep and hone..
Sarika has been with Vacha for the last 11 years. Originally as a student in our Girl’s centre now as a peer educator. She was part of a year-long project for PUKAR. The following news item appeared in Timeout Mumbai edition. Eve-teasing is an old law from British time prohibiting harassment of women in streets by roadside Romeo’s. Eve-teasers, television artists and orphan boys. Nergish Sunavala previews PUKAR’s annual research exhibition. Most girls do their best to avoid their neighbourhood eve-teasers. But Sarika Tripathi and some of the other girls in her Santa Cruz slum have spent the past year seeking out and interviewing the boys who annoy them as part of a year-long project for urban research group Partners for Urban Knowledge Action and Research. The girls, who also mapped the eve-teasers’ haunts, discovered that the boys believed that girls like the attention. “The boys say… ‘Girls themselves choose to wear fashionable, tiny clothes and make up so that we tease them, so that we harass them,'” said Tripathi. What surprised her was that education appeared to make no difference to that sentiment – the eve-teasers ranged from illiterate to highly educated. From May 28, Tripathi and 323 other barefoot researchers of PUKAR will showcase their research projects at the Tata Institute of Social Sciences as part of their graduation exhibition. Apart from eve-teasing, the projects look at issues like employment for the differently-abled in malls, careers of orphan boys and the lives of backstage artists in the television industry. PUKAR’s research groups over the years have included construction workers, juvenile delinquents, doctors and architects. The varied education levels and life experiences are a huge challenge but also part of the learning experience, said PUKAR executive director Anita Deshmukh. “We usually group them together [during workshops] in such a way that the ragpicker will sit next to the doctor,” said Deshmukh. Each group of approximately 10 people is encouraged to choose topics “located in their living experiences” and given Rs.5,000 a month for expenses. PUKAR also conducts workshops starting from the basics of how to write. Those who have had no formal education are given a voice recorder. In any batch, 37 per cent of researchers are from marginalised groups. This year a group of orphans from a government hostel will be doing a project on the challenges faced by their hostelmates in choosing a career. Last year, a similar group had a young boy who refused to say a word when he joined. “At the end of the year, he got up on the stage and he said, ‘Today I don’t feel guilty that I am an orphan,'” recalled Deshmukh. Research doesn’t change reality but it can have some real world effects. Tripathi’s group conducted a debate between boys and girls in their slum about whether young women should go out after 7pm. “The boys said, ‘Girls realise the dangers and still go out, they like it, they should stay at home and do the housework’,” said Tripathi. The girls countered by saying that boys do women’s work when they pick careers like hotel management, so why shouldn’t women cross gender boundaries as well? Even if the boys didn’t buy their arguments, Tripathi said, some of them gained some respect for the girls and the confidence they displayed. But why d hell such insecurities grown-ups feel about us when we are on the thresholds of mouldig into a WOMAN.??? As a girl from high-middle class family I do consider myself LUCKY that i get whatever i want esp.the FREEDOM i want. But what about those who have greater responsibilities,no education and many mouths 2 feed?